Oct. 21, 2013 - When Bill Boardman talks about his 33-year career as a faller, there’s a lot of passion in his voice for a job he says he was born to do. And there’s anger, too. A third-generation faller, Boardman grew up in a logging camp in Knight Inlet owned by his dad and granddad. Though he wasn’t a faller, his great grandfather worked in the woods, and was killed by a falling tree. Boardman has grieved the loss of 19 fallers during his four decades in the woods – among them were two of his closest friends. He’s become an outspoken critic of any working conditions that put fallers at risk. So when Boardman received the Cary White Memorial Award for Lifetime Achievement from the B.C. Forest Safety Council last fall, he accepted the honour with a mix of pride and sadness. He acknowledges that much needs to be done to make the forests safer for fallers. But those who’ve worked alongside the man known as the “faller whisperer” say it’s safety-driven professionals like Boardman who offer hope for future generations working in the woods. Boardman says he remembers the days when fallers were looked up to like kings: they had their own table in the cookhouse and a separate bunkhouse. The work was steady, and others accorded the same respect to experienced fallers they might an ancient cedar. But controversy – and tragedy – has dogged the industry since the early 2000s, when falling became the focal point for the dangers in B.C.’s forests. In 2005, the B.C. Coroners Service reported 45 forestry-related fatalities, seven of them fallers. 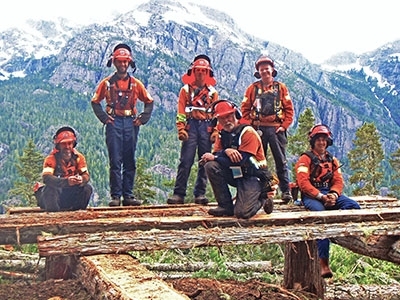 WorkSafeBC and the council have since worked together to create a culture of safety in the forests. One means of embarking on that safety mission has been through the certification of fallers under the new BC Faller Training Standard. Former faller Dave Gaskill knows firsthand what it’s like to benefit from working with Boardman, a bull bucker (faller and bucker supervisor) with “an unprecedented focus on safety” years before the introduction of training and certification standards for fallers. For information on B.C. faller training and certification, visit www.bcforestsafe.org/training/faller_certification.html.